One of the biggest advantages of a parish subscription to Formed is all the great content. I wrote a review of Formed and love it more every week. 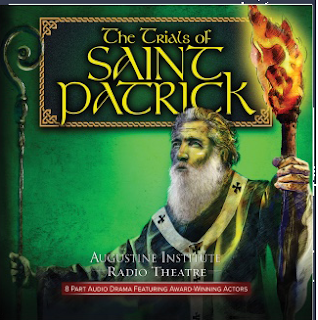 And this audio drama on the life of Saint Patrick is an amazing presentation. It is 3 hours and 21 minutes in length. It brings to life this saint, in a vivid way. Having read a few versions of Patrick's The Confessions of Saint Patrick and Letter to Coroticus, it would appear to serve as source material. This presentation presents an man, a man who made mistakes, a man who found God, and a man who spent his life in service of God. It is told from the perspective of Patrick being under trial, and his role as bishop in jeopardy. The story is told back and forth from the trial to Patrick's memory spanning his whole life. Two different actors play the voice of Patrick; John Rhys-Davies as Patrick the elder and Seán T. Ó Meallaigh as young Patrick. The story begins on the day of his capture by Pirates and goes until he is preparing to head to an island on Lough Derg. It was awesome just closing my eyes and listening to this presentation. My son who is 10 came in when I was almost done and asked if I could start over and listen to it with him. (One of his middle names is Patrick and he has a devotion to the saint. This story presents not just the great saint but the man. His trials in school, in ministry and even the literal trial he underwent. It is very well done and I am thankful to have listened to such an excellent production. If you are a fan of the Saint, or just love all things Irish you should give this story a listen.